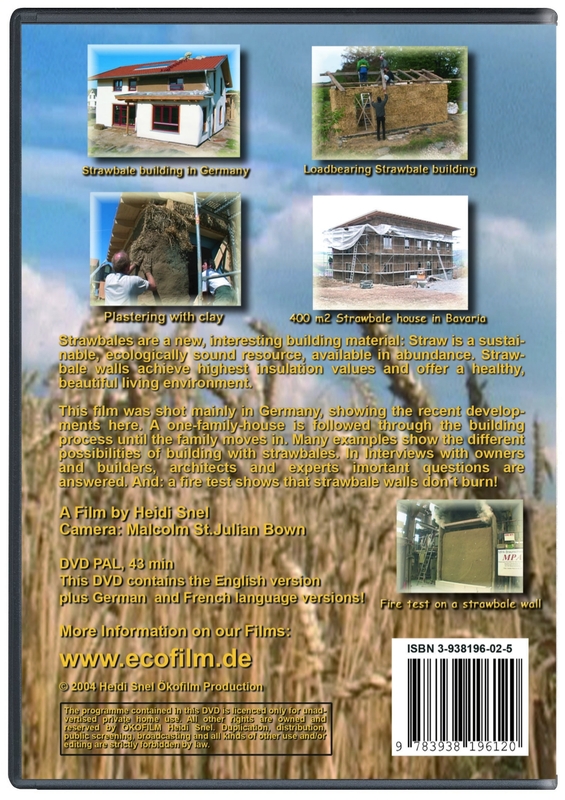 Product information "Houses of straw - part one"
Could it be that the house of the future was invented a century ago?In the 1890s, pioneers of the sandhills of Nebraska found themselves building a new life on a treeless prairie, and from necessity began building their homes from bales of straw. 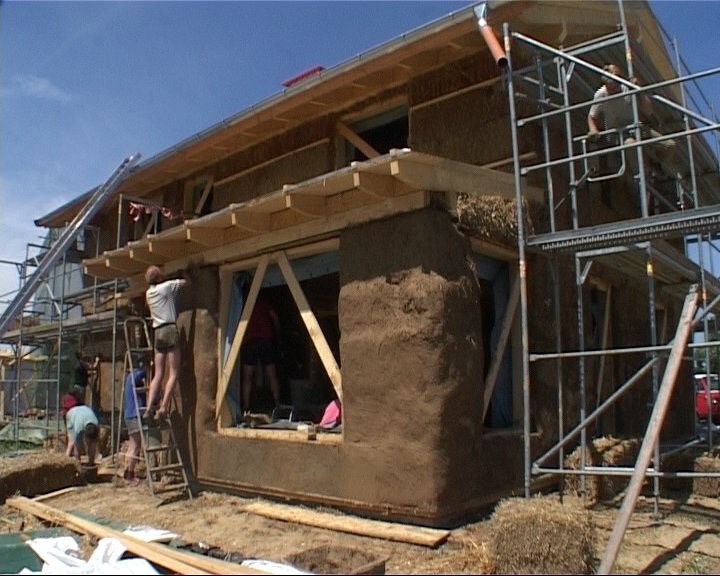 Today modern - day pioneers are choosing straw-bale construction for its many advantages. 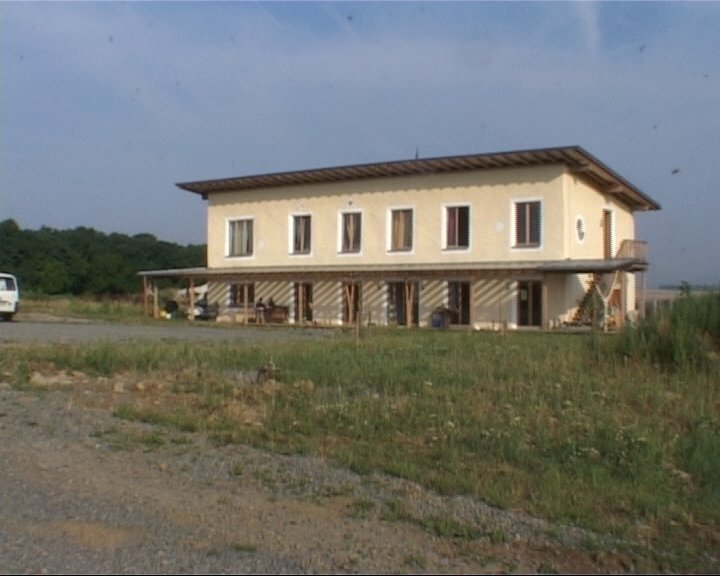 There are now bale structures in nearly all of the 50 states of the USA and in many other coutries as well. 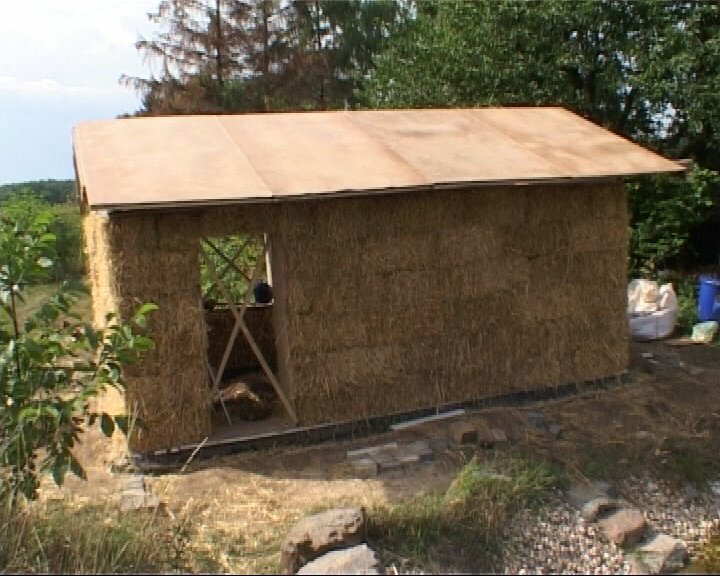 Building with straw bales is probably the only building technique developed originally in the United States and then coming to Europe. 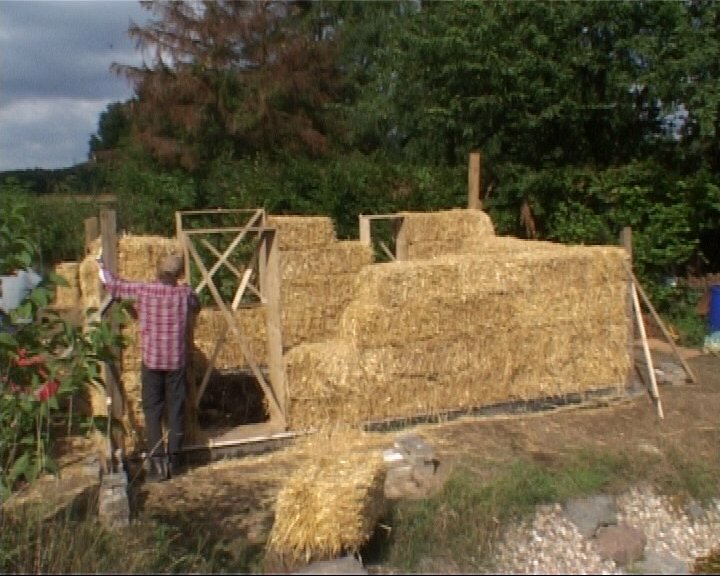 Straw is an annually renewable crop, available wherever grain crops are grown. 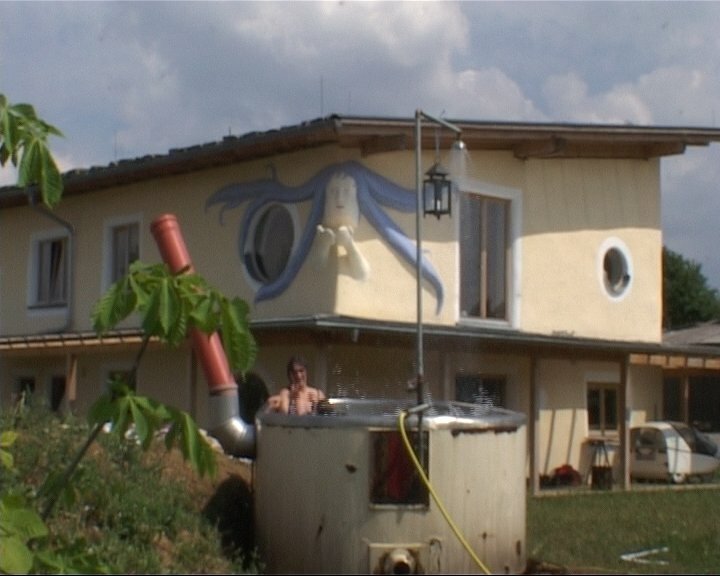 It is indeed a waste product, much of which is currently burnt in the fields. 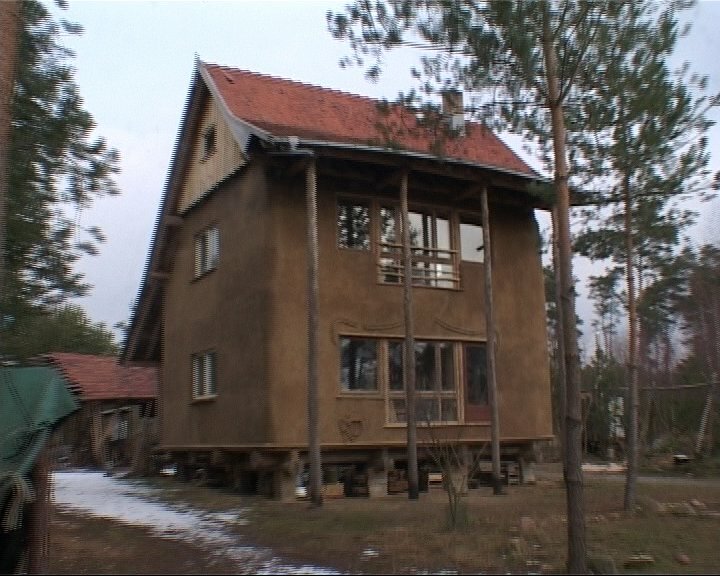 The thick walls offer superior insulation value, averaging R-48 for an 18" wall. 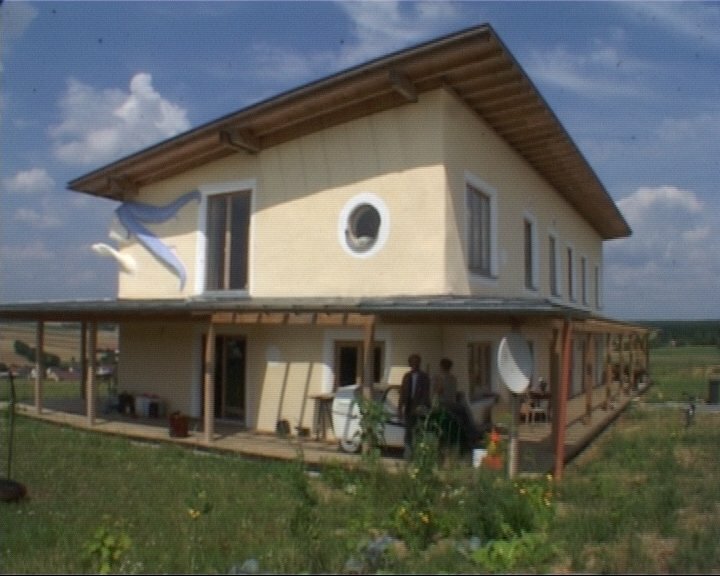 With a natural plaster, straw bale walls „breathe," and together with the sound absorbing qualities, provide a quiet, healthy interior environment. 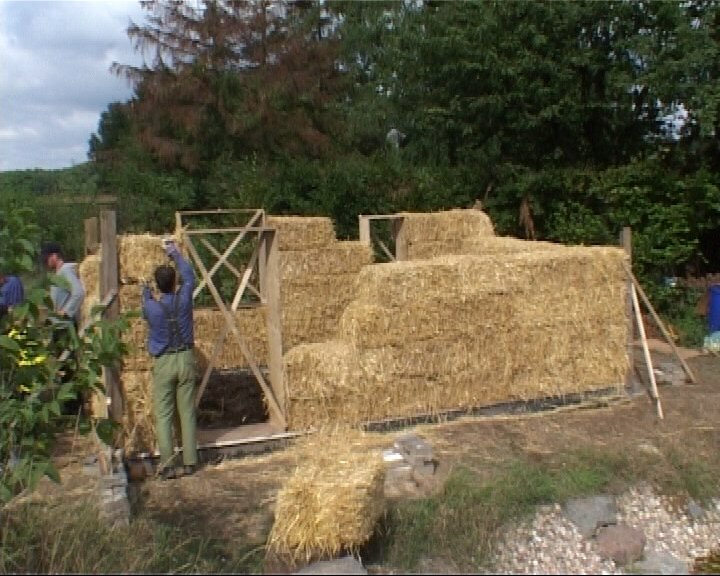 Straw bales can also be combined to great effect with other natural building systems. 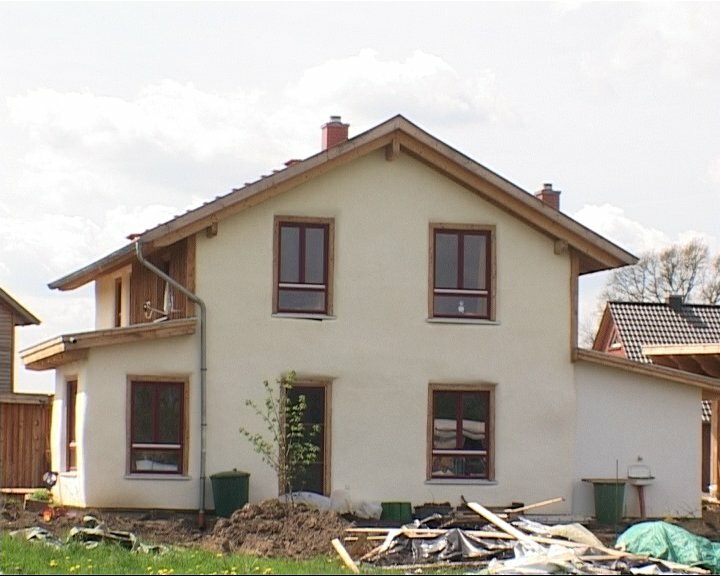 Construction costs can be reduced heavily: they are cheap to buy and easy to work with. 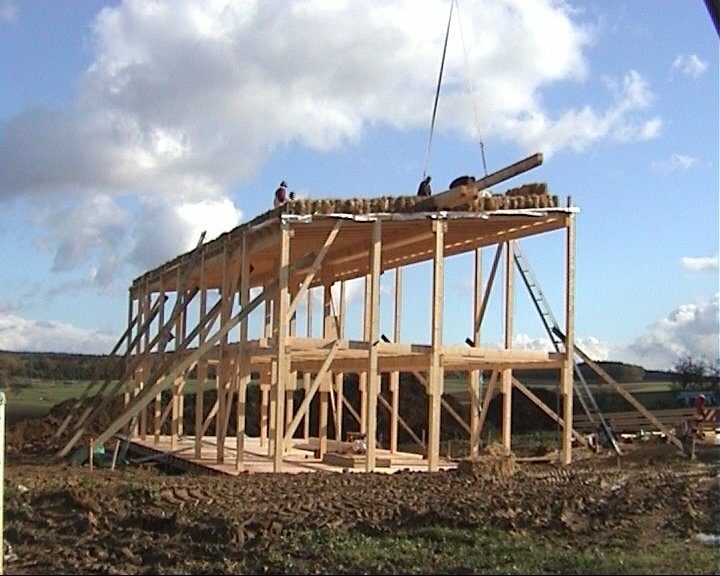 Stacked like huge bricks, straw-bale wall systems can be erected quickly without much building experience. 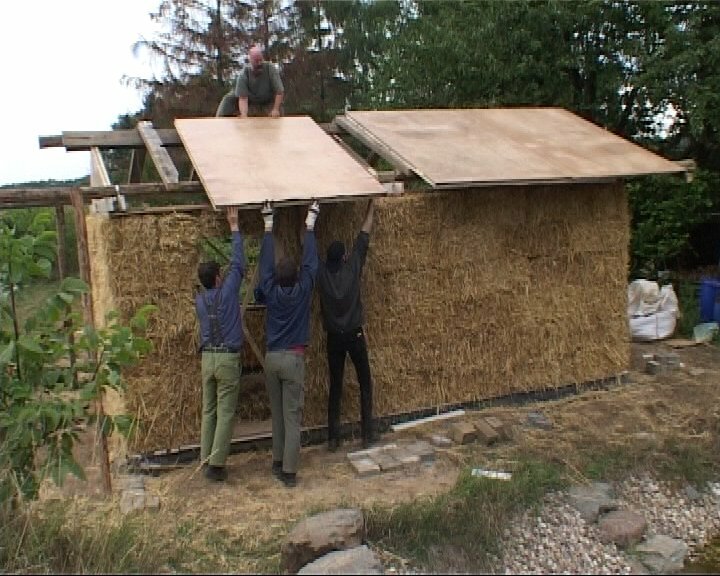 In a wall-raising party, it is common for all the straw bale walls in a modest-size structure to be erected in a single day. 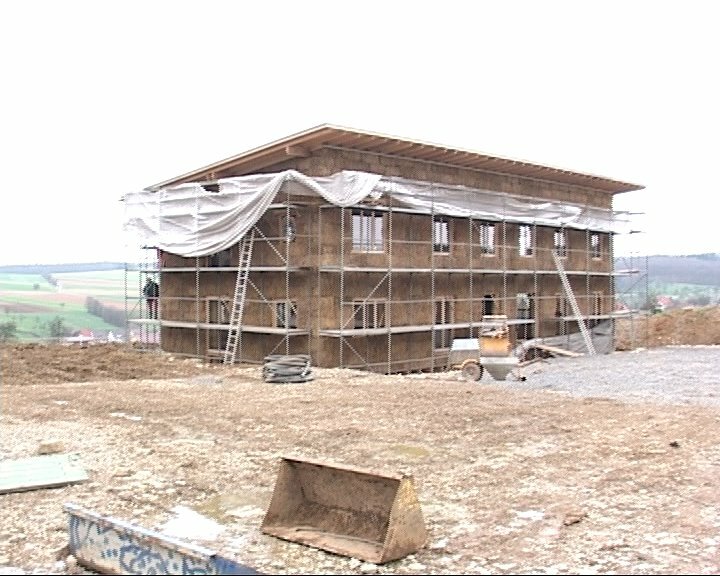 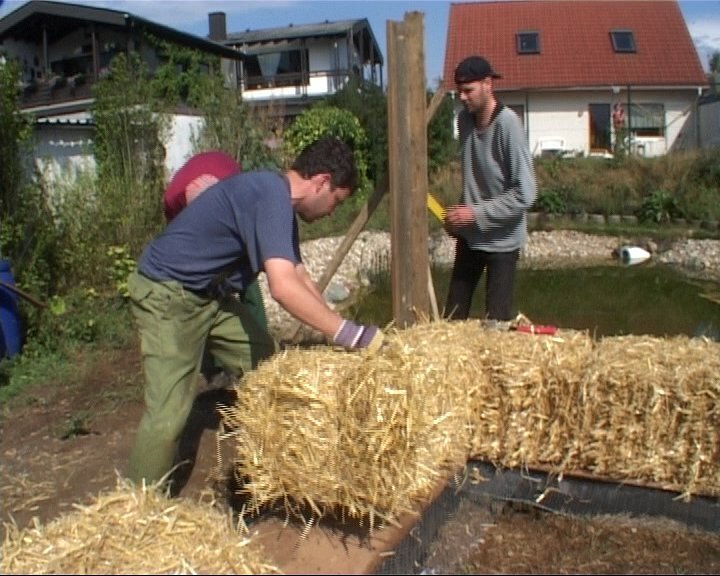 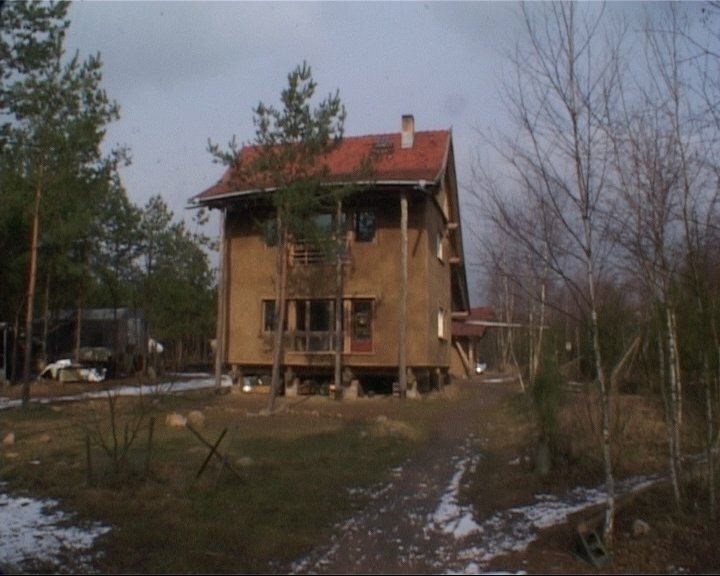 The German strawbale association gives information about the new way of building, and organises testing of strawbale for construction. 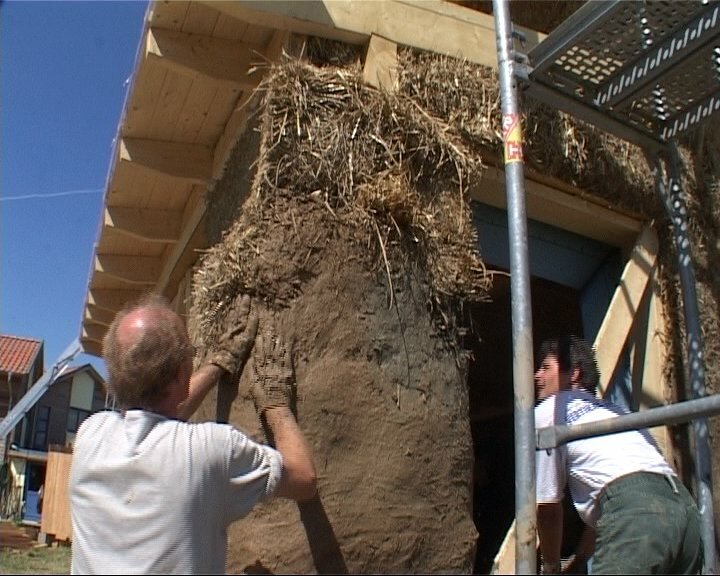 In Juli 2003 we filmed a fire test which shows: Strawbale walls don´t burn...A strawbale wall, plastered with clay, resisted a 1000 degrees Celsius temperature for 90 minutes without any trouble! 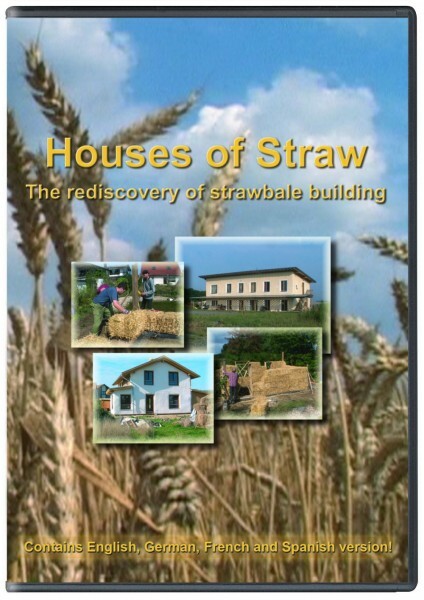 Related links to "Houses of straw - part one"